1964. 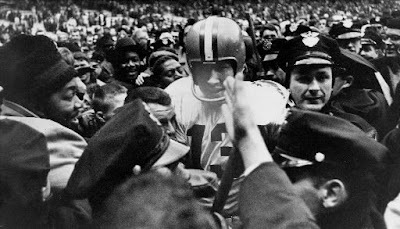 Browns QB mobbed after beating the Colts 27-0. Plain Dealer Files. Yesterday, the sports talk world and social media was ablaze with rumors of TJ Ward missing practice. The rumor on the radio was very mysterious, the announcer sharing that he was ok but was unexcused from missing practice. Then, the Browns claimed that the rumor was false and he was at practice. Then, it was rumored he had to call someone to pick him up and he missed the majority of practice and showed up for the tail end. Then, he went on twitter to share a picture of his honey on his lap. Then, the Browns denied, denied, denied. Then I heard a sharp, loud crack and my patience splattered like a giant pumpkin chucked off a bridge onto the pavement below. The internet became divided, pleading for patience as the about Ward's show or no show sneak out. My response was a quick NO. This Ward thing wouldn't have even started if there was nothing to it. And with the Browns playing the semantics game, clearly shenanigans were in place. And that friends, is part of the problem. There is no accountability with this team. No one cares. The agenda for the day is to have a good time and collect a pay check. Joe Haden goes off to Vegas and takes some high schooler's ADD medicine so he can party a little longer in Vegas. But, but, he made a mistake the apologists whine. Guess what? I DO NOT CARE. Greg Little spending more time on his post catch moves that he ignores the fact that he needs to CATCH the ball. But, but, the pass was off. It was Weeden's fault his fans moaned. To which I say, I DO NOT CARE. Catch the friggin ball and I might care. TJ Ward partying it up and wandering in late, if at all. But, but, he has a cast on the fans whimpered. Again, I DO NOT CARE. If he can lift a glass he can lift a page of the play book. I could go on and on, but I won't. I'm, starting to feel the vein in my forehead pop out. There is no leader on this team. Shurmur has no control and no respect of the players. Holmgren, is he even still in Cleveland? If the team is winning, they can chug Cristal out of diamond encrusted red solo cups for all I care. But these guys aren't winning. There is no frustration on the part of the players, except maybe Phil Dawson when he is trotted out to make a 60 yard kick. I'm sick and tired of being the laughing stock of the NFL. So, today, on the last game of the Learner legacy, how about we do something whacky and win a game?